Catch the Sewing Bug provides simple, do-able, fun projects for the younger, beginning sewing students. There is a great sense of satisfaction from being able to actually sew a project...especially one they can use themselves or give as a gift. This book is very basic, easy, and requires a minimal amount of supplies to complete the projects. All patterns and directions are included for each of the 25 projects. A wonderful resource for anyone who has an interest in sewing! Catch the Sewing Bug, by JoAnn Gagnon, is especially designed for younger hands working with adult ones, and is written in such a way that adults with no sewint skills can easily work their way through it. The book provides simple, do-able, fun projects. Each project builds upon skills learned in an earlier one, and by the time the child finishes the book, she not only has a fair repertoire of basic sewing skills, but also a large boxful of useful, fun items she has made! It is amazing how much even the youngest child, with a caring adult, a good machine, and this book, can do! So come alongside your child and watch her experience the fun of sewing and the gleam in her eye as she proudly shows off her creations and announces to all, "I made it myself!" 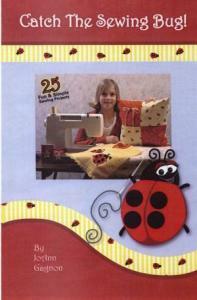 Turn her first experience with the sewing machine into a lifelong love and watch as she "catches the bug". Complete patterns & instructions are included for all projects.